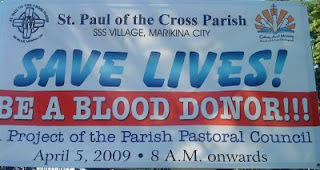 On Palm Sunday, April 5, 2009 from 8am till 12 noon, the Sacred Heart Room at the St. Paul of the Cross Parish in SSS Village will be accepting blood donors. This is a joint project by the Parish Pastoral Council and its satellite ministries and organizations, spearheaded by the Social Services Ministry with the Gabay Aral Committee as point person. The have a target of 175 donors on that day as to support the "save lives" mission. Any male of female aged 16 to 60 (donors below 18 need parental permission), with weight of at least 110lbs, regular pulse between 60-100/min, blood pressure between 90/60 to 140/100 and hemoglobin not less than 125g/100ml are eligible to participate in the blood-letting event. Individuals with active pulmonary tuberculosis, diabetes under insulin and oral hypoglycemic drugs, rheumatic fever, asthma within two months of last attack, chronic eczema, dermatitis or recurring boils, cardiovascular diseases, convulsions, epilepsy or other mental diseases, acute gastric ulcer within the past two years, current allergic reaction, cancer, filariasis, yaws and other long-standing skin diseases, hepatitis B, liver disease, syphilis and other sexually transmitted disease, HIV infection or anyone who had a serious illness within the past 3 months are not eligible to donate blood. For more details, please call the parish office at 490-7973.